Now you too can harness the power of the Versalino in your next electronics or robotics project! The Versalino Nano is designed as a follow on to the Versalino Uno (the first of our line of Prototype to Production platforms). It takes all the stuff you loved about the Versalino Uno, and adds some awesome features that you all requested. The first big change in the Versalino Nano is it’s impressively diminutive size it is only 1 inch by 2.1 inches, and has an much lower profile than the Versalino Uno. Additionally the button size and performance has been greatly improved on the Versalino Nano, making it much easier to reset when needed. Finally we added a power LED, and a general purpose LED which is attached to BUSA.D1 (which is pin 2 on the original Arduino 1.0 pinout). The Versalino Nano was the first product to undergo our rapid release program, and as such it has seen much more progress than it’s predecessor with 2 revisions so far from it’s initial release. The feedback you all have provided has been instrumental to these continued improvements, so thank you! Have you ever had to re-solder pins on an Arduino Shield just so that you could get it working with another shield? Have you ever had an Arduino Shield that didn’t bother to let you stack another shield on-top of it? Well with the Versalino Uno and Versalino Nano those are problems of the past. 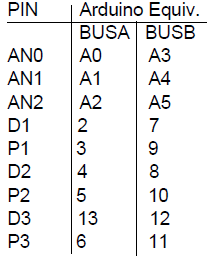 Listed above are the Arduino equivalent pins to each of the Buses in case you wanted to forego the use of the Versalino library. The Versalino Nano is not just another Arduino clone. The Versalino Nano is based on the Versalino Uno and is part of a line that has been completely re-engineered from the ground up to address real design problems that folks face every day on other systems. 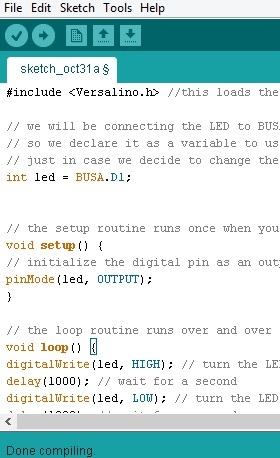 The key advantage of the Versalino line over other Arduino and Arduino compatible clones is that we developed a standardized BUS system that makes it possible to design a load board to take less than half of the available pins without sacrificing the ability to do tons of stuff with it. The Versalino BUS structure also allows the shape and size of your Versalino board to change without losing the compatibility with your loadboards. That is why every board that has been designed for the Versalino Nano is 100% compatible with the Versalino Uno (even though the Versalino Uno is twice it’s size). Finally with the Versalino Nano you get an extra COM port! The COM port on the Versalino is designed to provide you with plug and play Bluetooth compatibility with the Virtuabotix BT2S Slave and Virtuabotix BT2S Master, this is an extremely useful, and cost effective way to convert your project from a wired to a wireless solution. This additional port structure allows for the design of many serial communication devices that can be added to your system without interfering with other boards. The Versalino Nano’s second COM can either be used as a serial port using Software Serial libraries, or as general purpose IO’s (GPIO for short), it also has Analog to Digital capability which makes it perfect for taking sensor readings without messing with your projects BUS’s. A computer with a USB port, the Versalino Nano, and the Versalino FTDI. If you are new to programming you may be wondering what an IDE is. An IDE is an Integrated Development Environment, which aside from being a mouthful, is an extremely useful tool that is used to allow an individual to use high level code like C++ to develop programs more quickly. In the case of the Arduino IDE you are provided with a simplified C++ based approach to developing code that can be quickly developed, and uploaded to your Versalino projects. As you learn how to use this system you can even go as far as writing your own libraries, and taking advantage of direct machine coding techniques, and native C++ structures and classes. The first step before you can do anything with the Versalino, or any other Arduino compatible system is to install the Arduino IDE. 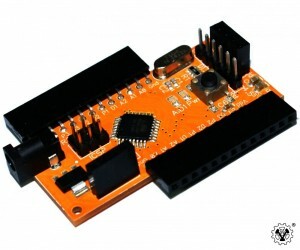 Thle Arduino IDE can be found for Windows, Mac OS or Linux at the following link -->Click to go to download page http://arduino.cc/en/main/software <--. Follow the instructions for your specific operating system as provided by Arduino in the link above. Note: Though there is a windows installer available now, most windows users have reported that they had a better experience downloading and extracting the zip archive version. This is as of version 1.0.5 and the windows installer may become more stable over time. FTDI itself is actually stands for Future Technology Devices International, a company whose initials (FTDI) have become synonomous with USB to Serial converters. The Versalino FTDI is named so because of the fact that it uses an FTDI chip as it's main processor. The reason you need a USB to Serial converter (like the Versalino FTDI) is to load programs onto, and communicate with your Versalino, and other Serial UART enabled devices. The key advantages of the Versalino FTDI over alternative versions is the fact that it has a built in Virtuabotix BT2S Com port for instant Bluetooth to Bluetooth connectivity between your Versalino and PC, and the fact that it has easily selectable voltage levels. Note: The Arduino USB Serial Light uses different drivers than those we will be discussing in this section, those drivers can be found in the driver folder of the Arduino IDE directory that you installed in the last step. If you are using Windows 7 or later, chances are that all you have to do is plug in the Versalino FTDI and your system will identify and install the drivers for you automatically, but if you are on Windows XP or earlier, or your system did not auto-detect the device drivers then you will want to install the drivers manually below. The FTDI Drivers can be found and installed from the following location -->Click to go to download page http://www.ftdichip.com/Drivers/VCP.htm and select drivers from the appropriate operating system to install <--. Now that you have installed your drivers you can plug the Versalino FTDI into the computer using the USB Mini B cable (make sure you have the 5V setting selected with the switch on the back). If everything is installed correctly you should now have a new COM port available on your computer. A library (in the Arduino IDE) is a specially structured piece of code that is intended to add or improve the existing functionality of your C++ environment. The libraries often handle complex problems, and device communication so that you do not have to handle low level, complex, or repetitive tasks directly in your code. Libraries can do anything that you can do in your sketches, or in C++ in general (as long as there is room on your device), but are generally used to store classes and functions to be used in your projects. Why should I install the Versalino library? First of all, you do not have to install the Versalino library for you to be able to use the Versalino. For all intents and purposes you can program the Versalino as if it were an Arduino Uno, but you would lose the ease of use of the pin-out, and may have to dedicate more time to selecting pin numbers, especially if you would like to take advantage of the Versalino's unique bus structure. Because of this we think it is much easier to use the Versalino library to take advantage of the simplified bus structure, and the direct use of standard Versalino pin names in your code. -->Click to go to the Versalino product page and download the latest Versalino library https://www.virtuabotix.com/productpage/0609224531828/ <--. Extract the zip folders contents and makes sure that you have just the library name as your folder. In example if your extracted contents folder was named VersalinoV1S2B then you will want to remove the V1S2B from the folder name, and then check inside that folder. If that folder contained a folder named versalino then you would use the subfolder as your library folder. If you don't use the folder that actually contains the .h and .cpp files, or you use a folder that is not named exactly the same as the main .h/.cpp file in that directory then the library will not work after it has been installed (because the IDE will not be able to find the appropriate files for installation. Installing a library in Mac OS or Linux can be a little more tricky, especially if this is the first time you are using the Arduino IDE. Unlike on Windows, your IDE does not have an accessible folder structure, so you will have to run the IDE before you can proceed. Once you have opened the Arduino IDE it will create a Sketchbook folder on your profile, you can easily find the location of this folder by using the top menu File -> Preferences and looking at the address in the sketchbook location at the top of the Preferences window. Once you have navigated to your Sketchbook directory you will have to create a subdirectory named "libraries" if one hasn't already been created for you. Now you can simply drop the Versalino (or other) library folder into that directory. Regardless of the operating system you used once the library folder has been placed in the "libraries" directory you will have to ensure that the Arduino IDE has been closed, and then re-open it before the library can be used. If you have installed the library properly you should now see a Versalino subsection in the File -> Examples submenu. If your install did not work, then you likely need to check the folder name, and make sure that you did not copy extra extracted folders into the libraries directory. Adjust and retry until you see the Versalino subcategory on the Examples menu. With all the boring stuff out of the way, it is finally time to get things rolling. Keep following the steps below to start doing something with your Versalino. Thanks again for choosing the Versalino, and best of luck with your nerdly adventures! Now for your very first Versalino project! Make sure you have your Versalino Nano, and Versalino FTDI before proceeding. This is a picture of the Versalino FTDI connected correctly to the Versalino Nano. WARNING: DISCONNECT ANY EXTERNAL POWER ADAPTER WALL OR BATTERY TO PREVENT OVER-CURRENT (BETWEEN EXTERNAL AND USB SOURCES). FAILURE TO DO SO MAY RESULT IN EXTREMELY HOT VOLTAGE REGULATOR AND POSSIBLE SYSTEM DEGRADATION. WARNING: DO NOT CONNECT THE VERSALINO FTDI TO THE VERSALINO BACKWARDS, OR SADNESS AND MAGIC BLUE SMOKE MAY RESULT. IF YOU CONNECTED IT THE WRONG WAY QUICKLY DISCONNECT THE USB AND TRY AGAIN THE CORRECT WAY. First connnect the Versalino FTDI to your computer with your USB Mini B cable and make sure that a new COM port is available on your computer like you did in earlier setup steps. Once you are satisfied with the setup you can plug it into the Versalino Nano. Make sure that the pins of the Versalino FTDI match up with the pins on the Versalino Nano PGM port (I.E. match G pin to G pin, V pin to V pin and so forth). If you have it lined up correctly the voltage selector will be facing toward the outside of the Versalino board. When you open the Arduino IDE it should conveniently create an empty sketch for you. A sketch is just the name Arduino gave to their .ino files which are the files you save your simplified C++ code for the Arduino and Versalino platforms with. Your code should look something like this once you have it copied properly into the Arduino IDE. Also note the menu at the top of the window which you will be using to configure and upload in the next part of this step. 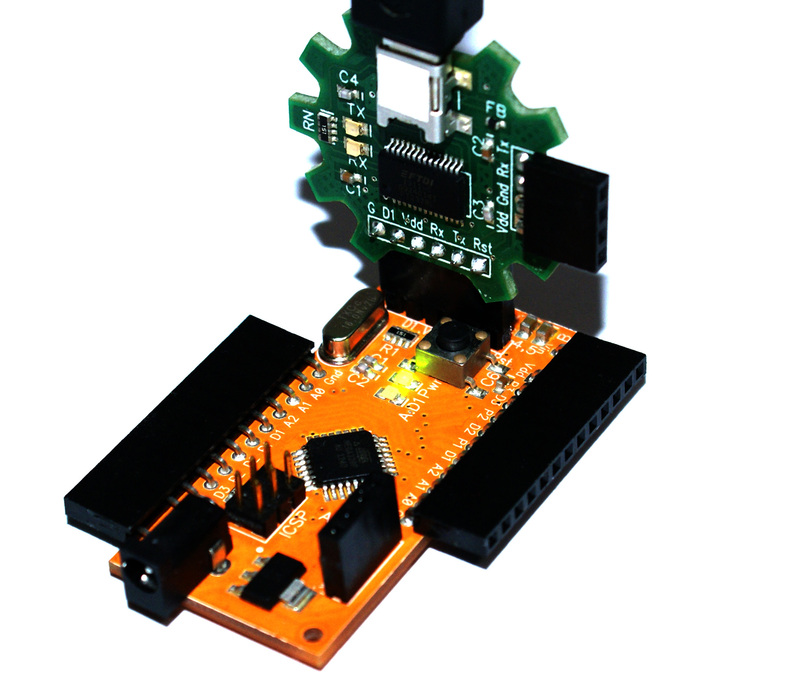 "Arduino Nano W/ ATmega328" is selected from the "Tools -> Boards" menu. "Arduino Uno" is selected from the "Tools -> Boards" menu. is selected from the "Tools -> Serial Port" menu. Now you should be ready to program your Versalino with your newly created sketch. Select "File -> Upload" and wait while your sketch is compiled, and uploaded to the Versalino. If you have set up everything correctly up to this point you should see a short series of blink red and green lights on the Versalino FTDI indicating that the program is being loading through the transmit and receive lines of the serial port. Once you see "Successfully Uploaded" at the bottom of the screen you are good to move onto the next step. Isn't having a built in LED Glorious? Why yes, yes it is! Since you are using the Versalino Nano this step should be pretty darn easy, just watch as the built in LED blinks, and if desired make a series of woop woop sounds as you watch your LED begins to blink just as you told it to. Feel free to bask in the mysterious glow as long as you see fit, and congratulations on finishing your first project! Congratulations, now you know how to load a sketch onto the Versalino Nano. You will be amazed by the world of devices and projects that you have just opened up. We can’t wait to see what you can achieve with the Versalino in your toolbox! Below are just a few of the projects that other nerdly heroes like yourself have already done with the Versalino, be sure to share your projects with us if you want them added to the list. Become a part of the Virtuabotix community!